Democratic activists have zeroed in on Sen. Susan Collins, the moderate Maine Republican, as their battle to defeat Supreme Court nominee Brett Kavanaugh closes in on its final days before a scheduled confirmation vote. A coalition of activists from Collins’s home state have so far raised over $US1.8 million from over 60,000 donors to fund Collins’ 2020 opponent if she votes “yes” on Kavanaugh. The effort targeting the centrist lawmaker could be the Democrats’ last hope for a Supreme Court without Kavanaugh. Democratic activists have zeroed in on Sen. Susan Collins, the moderate Maine Republican, in their battle to defeat Supreme Court nominee Brett Kavanaugh, which has reached a fever pitch as lawmakers close in on a final confirmation vote as early as Saturday. A coalition of activists from Collins’s home state have joined together with activist Ady Barkan on the political crowdfunding platform Crowdpac to lead a grassroots fundraising campaign that will support Collins’s 2020 opponent if the senator votes to confirm Kavanaugh. The unusual conditional fundraising effort has been quite successful so far – raising over $US1.8 million of its $US2 million goal from 64,000 donors as of Thursday. If Collins decides not to support Kavanaugh, donors will keep their money. One of the few remaining centrist lawmakers in the GOP, Collins has stayed largely mum on the controversial nominee, who has been accused by three women of sexual misconduct – charges he categorically denies. 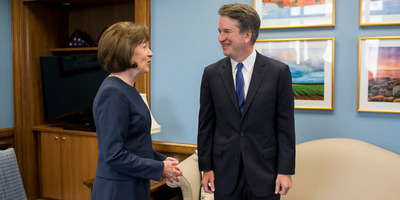 Even before Kavanaugh’s accusers came forward last month, Collins’s vote was in question after she announced that she would not vote for the judge if he expressed any “hostility” toward Roe v. Wade, the 1973 decision that established a constitutional right to abortion. Liz Jaff, president of the Be A Hero PAC, which has teamed up with Maine groups, said the effort has focused most intensely on Collins because the two other moveable GOP senators – Jeff Flake of Arizona and Lisa Murkowski of Alaska – appear more set on their votes, for and against Kavanaugh, respectively. The group also launched a more symbolic “rage campaign” against Sen. Chuck Grassley, 70% of the donors to which have been women. While some ethics experts say this novel form of fundraising could violate federal bribery laws, others say that while the practice is unusual and possibly distasteful, it can’t be considered bribery because it doesn’t involve giving anything to Collins in exchange for her “no” vote. 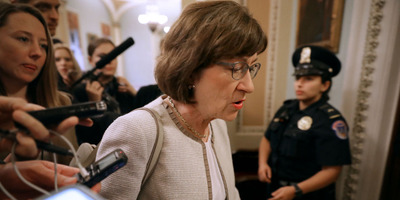 Collins condemned the effort this week, describing it as an attempt to bribe or “bully” her. Marie Follayttar, the co-director of Mainers for Accountable Leadership, said it’s cynical for Collins to criticise a grassroots campaign when she takes millions of dollars in donations from corporations. Zach Gibson/Getty ImagesSen. Susan Collins meets with Judge Brett Kavanaugh in August. But activists say Collins’s pushback is a sign that their strategy has already been effective. The campaign is something of a win-win for Democrats. Even if they’re not successful in convincing Collins to vote against Kavanaugh, they will have gathered nearly $US2 million and a 60,000-person email list for her 2020 challenger – significant firepower in a state as small as Maine. Jaff added that “countless groups” are ready to flood the state “the day after” a “yes” vote to begin voter registration and an effort to unseat the senator. But on Thursday, after reading part of the FBI report on its investigation into the misconduct allegations against Kavanaugh, the senator suggested that she was content with the thoroughness of the probe, which Democrats have roundly decried as being overly limited by the White House.